Pass 70-246 exam with the latest GreatExam 70-246 dumps: GreatExam 70-246 exam questions and answers in PDF are prepared by our experts. Moreover, they are based on the recommended syllabus that covering all the 70-246 exam objectives. Your company help desk uses System Center 2012 Service Manager to manage and track problems. You need to ensure that the manager of the help desk is notified automatically when a high-priority incident is updated. Before notifications are sent, first configure each notification channel, such as the settings for Simple Mail Transfer Protocol (SMTP). Notification messages are sent based on a notification template. Therefore, you will need to create a notification template. 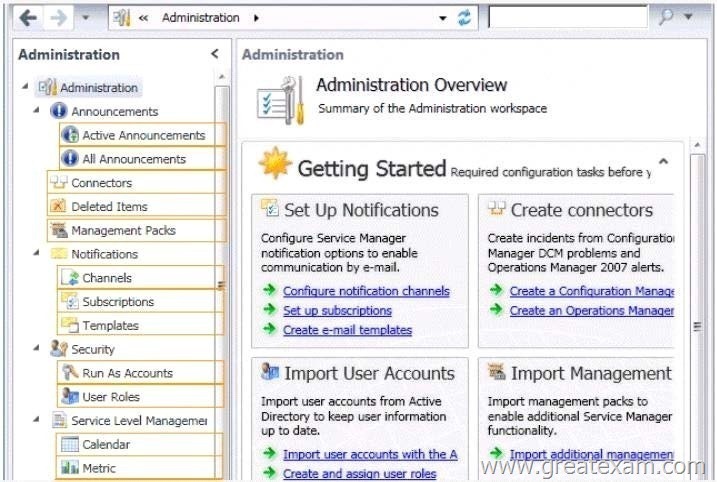 You can then use the Notification Subscription wizard to subscribe a group of users to a notification that will be sent whenever the changes that you specify occur. Finally, you can verify that a notification is sent by manually generating the change. Your role of Systems Administrator at ABC.com includes the management of the company’s private cloud. System Center 2012 – Operations Manager (SCOM) is used to monitor all network devices. The network has a leased line connection to your ISP. A router managed by the ISP connects the leased line to the LAN. The router is configured to allow only the ISP to access the configuration of the router to comply with the security policy of the ISP. You want to use System Center 2012 – Operations Manager (SCOM) to monitor the router and alert you if the router goes offline. You need to configure SCOM to discover the router while adhering to the ISP security policy. Which access mode should you use? This is a tricky question, but the answer is B, ICMP (ping) only. The question says “Operations Manager (SCOM) is used to monitor all network devices.”… This made me think that the answer had to be both ICMP & SNMPv2 (C), but that is wrong! It is wrong because if we specify that a device uses both ICMP and SNMP, Operations Manager must be able to contact the device by using both methods or discovery will fail. So it has to be B. Also worth noting that in Operations Manager, only ONE network discovery rule can be running per Management/Gateway server. Each server can only run one network discovery. You have a System Center 2012 R2 infrastructure that contains three servers. On which server should you perform each of the following actions? To answer, select the appropriate server for each action in the answer area. Your company has a private cloud that is managed by using a System Center 2012 Operations Manager infra structure. You have a line-of-business web application named App1. App1 stores its information in a dedicated Microsoft SQL Server 2008 database. You need to create a central diagram that contains the complete health information of Appl. You import the SQL, IIS, and Windows Server management packs. What should you create next? You need to create a distributed application first to be able to create the service level dashboard. First a DA, followed by a service level objective, and finally a Service Level Dashboard. The solution must minimize the number of Operations Manager permissions assigned to Group1. Your company has a datacenter in Los Angeles that contains a System Center 2012 Operations Manager infrastructure. You create three unsealed management packs named Pack1, Pack2, and Pack3. You create an override for Pack1. You create a group in Pack2. You need to apply the override for Pack1 to the group in Pack2. What should you do before you apply the override? B. Create a new class in Pack3. C. Create a new class in Pack1. E. Create a new class in Pack2. When you create a group, you save it to an unsealed management pack. However, an element in an unsealed management pack, such as a group, cannot reference an element in a different unsealed management pack, such as an override or a view. If you are going to use a group to target an override or scope a view, you must either save the group to the same unsealed management pack as the override or view, or you must seal the management pack that contains the group. 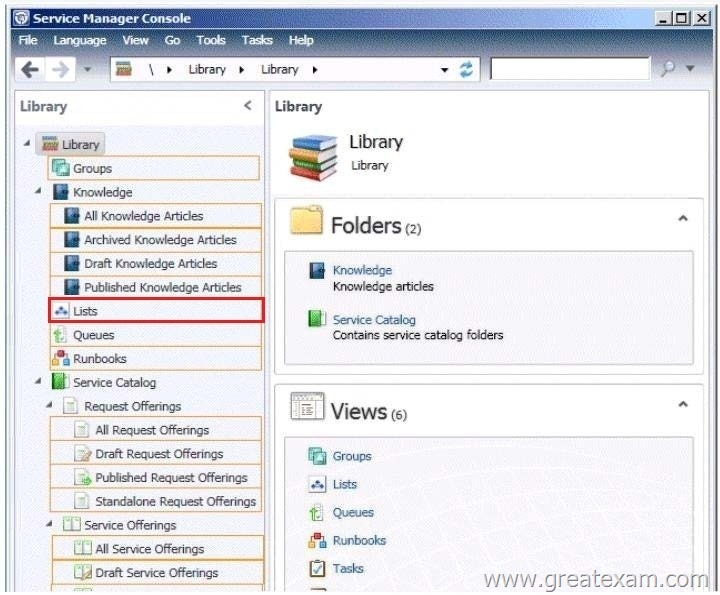 If you save the group to the same unsealed management pack as the override or view, you can only use that group for overrides and views that are also contained in that unsealed management pack. If you seal the management pack that contains the group, you can reference that group from other unsealed management packs. However, you cannot easily change any group settings in the sealed management pack or add new groups to the sealed management pack. The help desk uses Service Manager to manage and track incidents. Service desk analysts report that they receive many Windows 7-related incidents. You need to create a classification for the Windows 7-related incidents. What should you configure to create the classification? To answer, select the appropriate configuration in the answer area. Your company has a private cloud that is managed by using a System Center 2012 infrastructure. You discover that several users create incidents for the same issue by using the Self-Service Portal. You need to ensure that all of the incidents can be resolved as quickly as possible. A. create a service level objective (SLO). C. Select the Link to New Parent Incident task. D. Select the Escalate or Transfer the Incidents task. In SystemCenter2012-ServiceManager, one way a help desk analyst can create a parent incident is when an existing incident is already opened. You can create a parent incident using the following steps. A parent incident serves as a container for several incidents. The following procedure is performed on an incident that is neither a parent incident nor a child incident. 1. In the Service Manager console, open the Work Items workspace, and in the Work Items pane, expand Incidents. 2. Select any Incident Management view that contains active incidents, and then select an incident. 3. In the Tasks pane, click Edit to open the incident. 4. In the Tasks pane, click Link to New Parent Incident to open the Link to New Parent Incident dialog box. 5. In the Link to New Parent Incident dialog box, select a template to create the new parent incident with, and then click OK.
For example, select Networking Issue Incident Template, and then click OK.
6. In the Title box, type a new description or modify the description that is inserted by the template. 7. In the Affected user box, select the user who reported this incident. For example, select Joe Andreshak. 8. In the Alternate Contact Method box, enter additional contact information for the affected user (optional). 9. The Child Incidents tab appears in the form where you view the child incident that the new parent incident is grouped with and where you can add other child incidents. 10. In the parent incident form, click OK to close it. 11. In the original incident form, click OK to close it. Your company has a private cloud that is managed by using a System Center 2012 infrastructure. The network contains an Operations Manager infrastructure and a Virtual Machine Manager (VMM) infrastructure. You implement a Microsoft SharePoint Server 2010 farm that is hosted on 10 virtual machines. The company defines a service level agreement (SLA) for the farm’s availability of at least 99.9 percent uptime. You need to ensure that the company’s compliance officer can identify whether the SLA requirement is met. A. Create a distributed application that contains the servers and the services used by the farm. Add a service level objective (SIO), and then set the goal to 99.9 percent. B. Create a group, and then add all of the farm servers to the group. Create a Service Level Tracking object. C. Create a group, and then add all of the farm servers to the group. Create a performance collection rule for each front-end Web server m the farm. Configure an alert if network availability falls below 99.9 percent. D. Create a distributed application that contains the servers and the services used by the farm. Create a performance collection rule for each front-end Web server in the farm. Adding only the servers doesn’t mean, that the services (SharePoint) are available. So it must be a distributed application. You need to configure a solution to remediate the recurring issue automatically. You have a distributed application named App1. To define a service level objective for an application Open the Operations console with an account that is a member of the Operations Manager Administrators user role. In the Service Level Tracking dialog box, type a name for the service level that you are defining. For example, type LOB Application 1. Optionally, you can provide a description. On the Objects to Track page, under Targeted class, click Select. In the Select a Target Class dialog box, select a class for the service level, such as Distributed Application, from the list in the text box. You can search for a class by typing its name into the Look For text box. Click OK to close the Select a Target dialog box. You can use the Scope option to specify the scope for the service level. The default selection is to use all objects of the targeted class. Select the management pack that this service level will be saved in. You can use an existing management pack or create a new one. From the Monitor drop-down list, choose the specific monitor that you want to use to measure the objective. For this scenario, choose Availability. On the Service Level Objectives page, click Add, and then click Collection rule SLO to create a new collection rule. Under Performance collection rule, click Select to open the Select a Rule dialog box. Specify the performance collection rule to use. For this scenario, choose Collect Processor\ % Processor Time performance counter, and then click OK.
Use the Service level objective goal drop-down list to specify either Less than or More than, and enter a value in the adjacent text box. For this scenario, choose Less Than and 80. Your company has a private cloud that is managed by using a System Center 2012 infrastructure. The network contains a Microsoft SharePoint Server 2010 server farm. The server farm is hosted on 20 virtual machines. You deploy a custom solution to the SharePoint server farm. The solution requires that a new Web.config file be deployed to all of the front-end servers. You need to identify which front-end servers have an outdated version of the Web.config file. What should you do? Additionally, you can check for compliance with software updates and security settings. By Gol: Typical Microsft question. Should you create a baseline first or just monitor. The infrastructure contains several Hyper-V hosts. You configure VMM to use an update server and to synchronize the updates by using a Windows Server Update Services (WSUS) server. You attempt to verify compliance with the Sample Baseline for Security Updates. You need to ensure that you can verify compliance for the Hyper-v hosts. On the Home tab, in the Add group, click Add Resources, and then click Update Server. In Computer name, enter the fully qualified domain name (FQDN) of the WSUS server (for example, VMMServer01.contoso.com). Specify which TCP/IP port that the WSUS website listens on for connections (for example, port 8530). Enter credentials for connecting to the WSUS server. The account must have administrator rights on the WSUS server. If necessary, select the Use Secure Socket Layer (SSL) to communicate with the WSUS server and clients check box. The WSUS server will be added to VMM, followed by initial synchronization of the updates catalog. Depending on how many update classifications and products you chose when you installed the WSUS server, this operation can take a long time, depending on such factors as network traffic and the load on the WSUS server. To find out the status of the operation, monitor the status of the Add Update Server and Synchronize Update Server jobs in the Jobs window or in the Jobs workspace. After you enable update management in VMM, you should manage the WSUS server only through VMM, unless you are using a WSUS server in a Configuration Manager environment. In the Fabric workspace, on the Fabric pane, expand Servers, and click Update Server. The results pane should display the WSUS server. In the Library workspace, on the Library pane, expand Update Catalog and Baselines, and then click Update Catalog. The results pane should display the updates that were downloaded during WSUS synchronization. All of the TCP ports from i to 1024 are allowed on the firewall. You need to ensure that Server2 can send security events to Server1. A. From the firewall, allow TCP 51909 from Network2 to Network1. Your company has a private cloud that contains a System Center 2012 Service Manager instance. Service Manager has the Self-Service Portal installed. You create a service offering that contains a single request offering. The service offering provides logged-on users with the ability to add their user account automatically to a group named ServiceGroup1. The company’s security policy requires that an administrator named Admin1 must approve all requests for group membership change. You need to configure the infrastructure to meet the requirements of the company’s security policy. I am brand new to SCSM/SCOrch and am fumbling my way through it. I have finally gotten a runbook successfully created, service request offering completed, and published it to the portal. I filled it out and submitted it on the portal a couple hours ago and it still sits “In progress”. I cannot for the life of me figure out how in the world to approve the request. I assume once I approve it the rest will be completed automatically. For approval you need to add a Review Activity to the Service Request Template at the Activity tab. UI filter scope: This filter is for defining what an operator can see in the SCSM console. Limiting the options visible in the console improves the usability. UI filters can be set on console tasks, templates and views. Your company has a private cloud that is managed by using a System Center 2012 infrastructure. The network contains a Virtual Machine Manager (VMM) infrastructure and an Operations Manager infrastructure. B) The Internet Information Services Management Pack provides proactive and reactive monitoring of your Internet Information Services (IIS) environment. C) The File Services management pack retrieves events and other health information generated by the services that make up the File Services role. The network contains two network segments that are separated by a firewall. You have a management server named Server1. 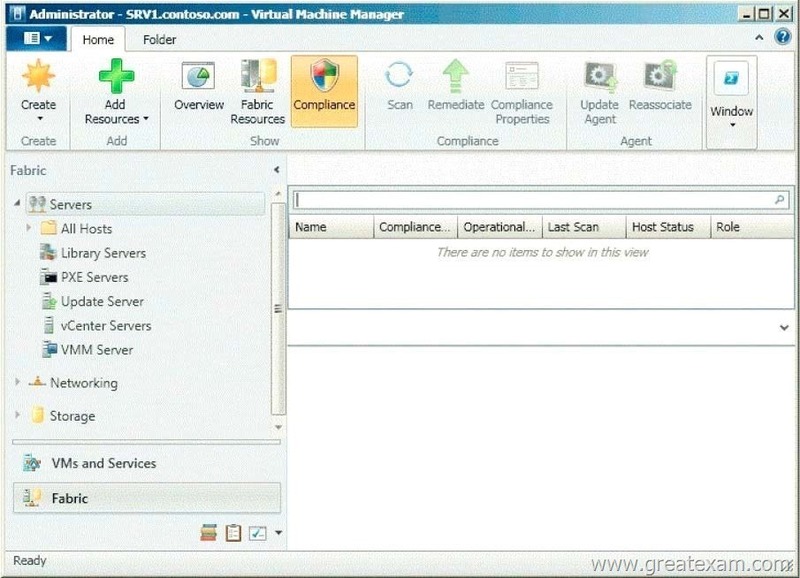 You create a discovery rule and configure the rule to discover SNMP devices. You discover that only the devices on the network segment that contains Server1 are discovered. You need to ensure that the devices supporting SNMP on both network segments are discovered. Which firewall port or ports should you allow on the firewall? The network contains an Active Directory forest named adatum.com. Operations Manager monitors a server named Operations1. Operations1 has a computer account in an organizational unit (OU) name ServerOU1. For any particular rule/monitor, OpsMgr will enumerate all instances of the target class and apply the rule to each. If there are no instances of the target class on a particular agent, then the rule will do nothing. It’s that simple. If I can’t target groups, why are they listed when I select a target for a rule? Groups are classes just like any other. They’re singleton classes where the class and the instance are one and the same, but they are classes nonetheless which is why they show up in the list with all other classes. There are really very few circumstances where you will target a rule at a group though. What if I do target a group? You can apply a rule/monitor directly to a group, but it will execute against the group object itself. OpsMgr will not enumerate members of the group and apply the rule to each. Any rules targeted at groups will actually operate on the Root Management Server since groups have no host and unhosted objects are managed by the RMS. To the specific question of how to get a particular rule/monitor to a subset of components, you have two basic options. Let’s say for example, you have a particular subset of web sites that you need a particular rule to apply. You could target that rule at the IIS 2003 Web Site class for example, but that would apply the rule to all instances of that class. It would probably apply to sites that you didn’t want. Option 1 would be to create a new class and target the rule at the class. In the case of an IIS site, this would mean that you would need to go to the Authoring Console or raw XML and create a new class and discovery. That’s a more advanced solution that most customers will do and probably overkill anyway. Option 2 is the create a rule target at the whole class and disable it. Create a group with the sites you want and create an override for that group to enable your rule. This might sound like a workaround, but it’s a completely valid solution. How do I know if I’m selecting the right target? The easiest method to validate you are using a target that actually has instances is to use the Discovered Inventory view in the Operations Console prior to creating your rule/monitor. In the Actions pane is an option called “Change target type…” that will bring up the same Select a Target Type dialog box that you see when you select the target for a rule/monitor. This view will list all instances of the target class you select. You can validate which agents have an instance of that class and how many instances each has. If there are no instances listed, then the rule isn’t going to do anything. If there are instances, then you not only be confident that the rule/monitor will execute on the agent, but you can also view the properties of the instance that will be accessible to any rules/monitors targeted at it. For more information on the use of groups, see Creating and Managing Groups in the Operations Guide. This article provides example of group definitions. The examples describe the items to select in the Query Builder and the resulting formula. Your company has a private cloud that is managed by using a System Center 2012 infrastructure. The private cloud contains 200 servers that run Windows Server 2008 R2. All of the servers are managed by Operations Manager. The private cloud contains an application named App1 that is deployed on-demand to several servers. The servers that run the application are identified by a registry value set during the application’s installation. You create a monitor that targets all of the servers. In Operations Manager 2007, you can create attributes to define a commonality within a group of objects that you want to monitor. After you create an attribute, you can create a group whose members are only objects that have the commonality described in your attribute. For example, if you want to monitor a set of servers that all have a common registry value, you create an attribute based on that registry value. To find the servers that have that registry value, you create a group that has a dynamic inclusion rule for only those servers that have the newly created attribute and target the group only to the server object type. Operations Manager then checks the registry of each server to see whether that registry value exists. If it does, that server is added as a member of the group. When you create an attribute, you must select an object type as a target for it. Operations Manager adds the new attribute to the existing list of attributes for that object type. If the target you select is from a sealed management pack, the object type also is sealed and the new attribute cannot be added. Instead, Operations Manager creates a new object type to which it adds the new attribute. By default, this new object type is named after the original object type with _Extended appended to the original name. This new object type contains all the attributes of the original object type, in addition to the attribute you are creating. You can view existing attributes in the Monitoring area of the Operations console. If the attributes are defined within a sealed management pack, you can view the properties of the attribute but you cannot change them. The properties of an attribute include information about where the attribute information is stored, such as the registry or through WMI. You can create a new attribute for any monitored object, and you can change most of the properties of an attribute that you create. However, the Attribute Type property, which identifies the source of the attribute information such as the registry, cannot be changed after an attribute is created. Comparing with others’, you will find our 70-246 exam questions are more helpful and precise since all the 70-246 exam content is regularly updated and has been checked for accuracy by our team of Microsoft expert professionals.